The "State Policy Network" is a coalition of 66 far-right organizations who've been given $80M by a small number of billionaires, including the Walton family (heirs to the Walmart fortune), the Koch Brothers, and Betsy DeVos; they're terrified of the teachers' uprising, in which wildcat strikes have raced across America because teachers whose unions were neutralized have been put on starvation wages in underfunded facilities. Without any union bosses to keep them in check, the teachers have demanded the world -- and they're getting it. 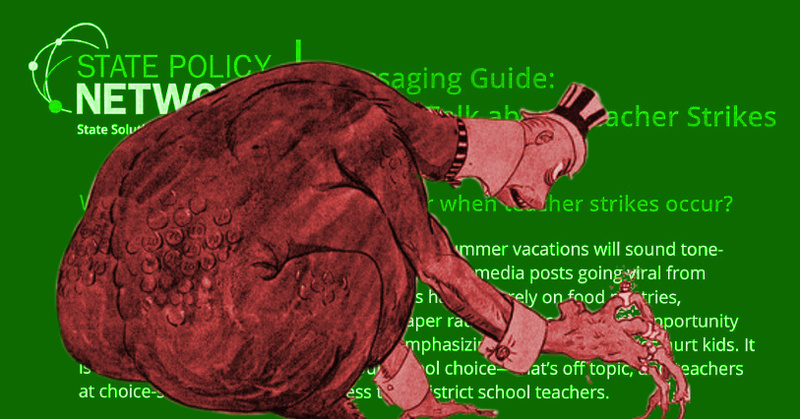 A leaked document ("Messaging guide: How to talk about teacher strikes") sets out a detailed plan for discrediting the striking teachers by holding out "low income families" and "good teachers" as the victims of the strike. It also candidly admits that people in states that have been looted by right-wing governments are more sympathetic to the teachers who are educating their children than they are to the billionaires who are destroying their futures.